The increasing number of HOAs and the properties they manage is driving increasing complexity and cost in collecting and processing demographic and payment data. In this 3-part series, we will look at the rising number of HOAs and the complexity of data procurement, the factors that drive the costs of procuring HOA data and create a model for predicting the costs of HOA data procurement. The fastest growing segment in the US housing market is the Common-Interest Developments or CIDs. These communities are master-planned developments that include single family homes, condominiums, and cooperative apartments. In almost every case, these developments are managed by a Homeowners Association or HOA. By definition, an HOA is an organization in a subdivision, planned community or condominium that makes and enforces rules for the properties within its jurisdiction. Those who purchase property within an HOA’s jurisdiction automatically become members and are required to pay dues, known as HOA fees. For practical purposes, anyone who wants to buy a home in an HOA-managed community agrees to abide by a set of rules such as Articles of Incorporation, Covenants, Conditions and Restrictions (CC&Rs), and By-Laws. Some associations can be very restrictive about what members can do with their properties. HOAs are governed by federal, state, and local laws and regulations that vary by jurisdiction. These can be relatively minimal, like Massachusetts, or very extensive, like California and Florida. 25 states have adopted some version of the Uniform Common Interest Ownership Act (UCIOA) and/or the Uniform Condominium Act (UCA). Other states have adopted their own statutes and regulations to govern HOAs. Most jurisdictions, regulations have been created to allow an HOA to initiate foreclosure processes to collect delinquent fees – often taking a priority position over existing lien holders. 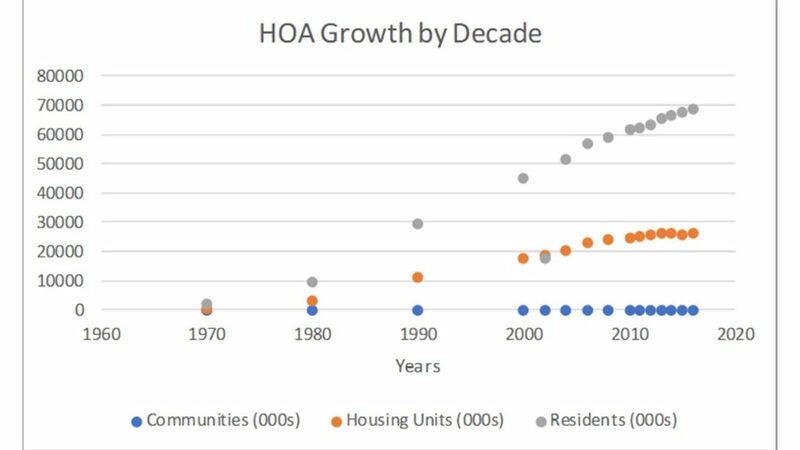 The first HOAs appeared in the US in the mid-19th century and their growth was limited for the next 100 years. HOA communities began gaining popularity in the 1960s as the construction of highways and other infrastructure led to large-scale suburban development. Data from the Community Association Institute (CAI) indicates there were only 10,000 HOAs managing 700,000 properties in 1970. As the available land for residential developments has become more scarce, and development costs have escalated, the trend is toward more dense developments centered around common spaces. In addition, consumer preferences have shifted towards communities with more architectural controls, centralized amenities, and shared maintenance. HOAs provide many benefits to governments, developers, and members. Municipal governments benefit because HOAs shift the burden of the cost of building and maintaining roads and other infrastructure away from the government and onto the developer and community residents. Developers prefer them to reduce costs and create higher selling prices. Members enjoy living in communities with others who share their preferences for architecture and lifestyle – and in many cases higher resale values. Data from the CAI, HUD, and the US Census Bureau tell us the number of HOAs, the number of properties they manage, and the number of people living has been growing since the 1970s. From 1970 to 1980 this growth was over 300%. Although the rate of growth has been steady over the last decade at 1%-2% per year, this number still represents an increase of over 1.2 million properties per year. Today there are over 342,000 HOAs governing 30 million homes in the US today. Last year, approximately 68% of all housing starts were in an HOA-governed community – over 1.2 million homes. The sheer numbers make it increasingly complex to obtain accurate and timely HOA data for titling and lending services. The first challenge is determining if a property is managed by an HOA. Available centralized databases with this information may be incomplete. Multiple public and jurisdiction databases must be searched – if they are available. Often, manual research is the only method to make this determination. The second challenge is contacting the HOA to collect the property and payment information. The determination of who, when, and how to contact the HOA may be difficult. Many HOAs are run by volunteer members of their community with limited availability. HOA Boards tend to have rotating members with frequent contact and contact information changes. The third challenge is data reliability and risk. Difficulties in obtaining accurate and timely data increase the risks to internal processes. In addition, data inaccuracies increase the risk of negative financial impacts to the organization and customers. In our next installment, we will discuss the factors that drive the costs of collecting and processing HOA demographic information and other property payment and status data.